Founded in 2000 as a companion site to HG.org, HGExperts.com has become the place for medical and general expert witnesses in all fields, legal marketing experts, legal consultants, and other companies and professionals who provide law-related support services, to make themselves visible to to the legal community and to market their services they provide. Our testimonials speak to the effectiveness of listing with HGExperts.com. Searches for terms like "medical experts", "expert witnesses", and "legal speakers" in the search engines unfailingly result in HGExperts.com on the front page of the search results. Whether you are an Expert Witness looking for business, or a legal professional looking for an Expert Witness, HGExperts.com is the place to go for excellent results. General Expert Witnesses - This directory lists expert witnesses in hundreds of areas, from 3D Modeling, to Fuel Gas Explosion, to Web History Analysis, and the categories are growing every day. The companies and professionals are listed by areas of expertise. Visitors may search via the expert witnesses lists or by "search terms", State/Province and/or country in the search engine. Medical Expert Witnesses - These experts provide highly specialized services covering more than 500 medical conditions and diseases in nearly 1000 categories. Medical expert witnesses play an invaluable role in medical malpractice, workers' compensation, personal injury and other similar legal cases where courts rely heavily on their reports and testimony. Links to all of these directories can be found on our Medical Expert Witness Index page. Legal professionals may use our search engine to locate medical expert witnesses by "search term", State/Province and/or country, as well. Forensic Experts - These experts specialize in the fields of forensic science, applying the methods and techniques of the natural sciences - such as biology, physics, and chemistry - to legal issues. Unlike general expert witnesses, who may testify on their area of expertise in a more general manner, forensic experts usually testify on evidence directly affecting the legal case. Appraisal, Valuation - Litigation support services such as valuation of businesses, securities, mergers and acquisitions, assets appraisal and more. This includes all activities designed to assist lawyers, law firms and legal departments with case analysis and trial preparedness. Banking and Finance - Litigation support services in finance, economics, banking, taxation, accounting, financial fraud, lending practices, risk-management and more for banking and finance -related litigation. Case Review and Management - Case review for merit via document production, examination, and review, and contract management and reporting. Jury Selection - Prepare effectively to interview, analyze and select a jury pretrial, as well as read the jury during trial, and after trial, review and analyze the lawyer's effectiveness. Marketing Litigation Support - Professionals skilled in strategy, internet marketing, website development, Legal Search Engine Optimization and more. Medical - Litigation support for complicated medical cases with those experienced in medical standard of care evaluation, peer review, medical records retrieval and review, summaries & chronologies, and more. Technology - Keeping abreast of specific technology fields - IT, Telecommunications, Data Recovery, Computer Forensics, software technologies, mobile computing and other advances in this field - for case preparedness and successful litigation. Translations - Directory of language specialists, translators & interpreters experienced in the legal field, for depositions, mediations, trials, witness preparation, client consultations & document translation. Trial Presentation - Assistance in collecting, managing, retrieving and presenting the monumental amounts of information necessary during trial, and with the use of graphics and animation, video, charts and photos for trial presentations. Employment - Litigation support service providers experienced in employment-related claims, with information regarding Human Resources, employee investigations, compensation, termination, discrimination, testing, policies and procedures, pensions and 401K plans, employment contracts and much more. Environmental - Analysis and research litigation support in many fields related to the environment - horticulture, chemicals and energy industry; meteorology, climate and weather; air quality; forensic geosciences; environmental and chemical forensics; energy conservation, etc. Legal Costs - Litigation support services providing account reviews; forensic account analysis; identifying, predicting and reducing legal costs, fees and expenses; calculate lost wages and financial industry consulting in arbitration, litigation, consulting and mediation. This includes legal audits on legal billings, and assistance in the assessment, negotiation and mediation of legal fee disputes. Management - Litigation support services dealing with effective and competitive management in the legal field, such as pre-trial and post-trial writings, research issues and concepts, advice on methodological issues, review of expert witness backgrounds, reports and testimony. Also includes litigation support knowledge for cases associated with claims in other fields related to management issues. Expert Witnesses Publications - Links to legal guides and articles written by general and medical expert witnesses, and legal marketing consultants discussing topics related to the justice system, industries, businesses and medical specialties. 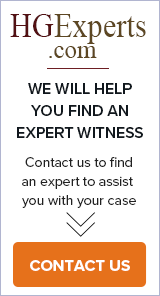 Expert Witnesses - Most Recent legal articles published by our expert witnesses. Medical Expert Witnesses - Articles written by prominent medical expert witnesses. Articles Writing - Guide to publishing expert witness articles on HGExperts.com. Expert Witness Marketing - Articles by marketing consultants written to help expert witnesses promote their services and expertise. Guidelines - Links to useful guidelines for expert witness testimony. Forensic Science - Information, resources and links related to forensic science and forensic psychiatry. Mediation - Information, resources and links related to mediation.